Speakers for the services are selected by the Church elders, however we have the following regular speakers. Willie Gonzales started NEF in 1996. He has lived in Japan for 16 years with his wife Mimi. Willie and Mimi were both born in the Phillipines. Willie works as an English teacher and an artist, but his hidden talents are abundant. You'll find him fixing bicycles, racing cars, cooking, stumping you with random trivia, singing, playing badminton or volleyball, cycling, painting, sculpting, and even once in a while telling you a gag or two. 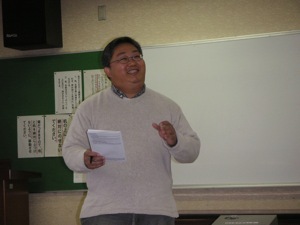 Willie attended Asian Theological Seminary and was ordained in November 2002.